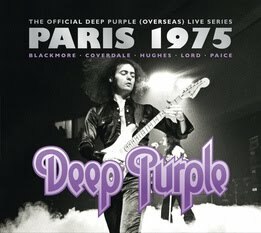 Deep Purple will release a 2 CD/digital reissue of "Live In Paris 1975" on January 29. "Live In Paris 1975" has been digitally remixed and re-mastered from the original multi-track recordings. Originally released via Purple Records, this historic concert is now presented in stunning, updated audio quality. Recorded on April 17, 1975 at the Palais des Sports in Paris, this was the very last concert with guitarist Ritchie Blackmore, who was leaving Purple to form Rainbow. Blackmore, vocalist David Coverdale, bassist/vocalist Glenn Hughes, keyboardist Jon Lord, and drummer Ian Paice roared with strength on such classics as "Burn", "Stormbringer", "Highway Star", "Space Truckin'" and "Smoke On The Water". The project is the first of 10 classic Purple recordings to be updated and reissued. The group will release their 19th studio album in the U.S. on April 30 (April 26 outside of North America). After various songwriting sessions in Europe, the band recorded and mixed the project in Nashville with producer Bob Ezrin.